Dubrovnik is a city and a popular cruise vessel port in the southern most part of Croatia on the coast of the Adriatic Sea. Dubrovnik is home to approximately thirty thousand people. Although relatively small in size Dubrovnik is the biggest city in its whole gravitating region of roughly hundred thousand people and is a well known, respected, and highly expressed cultural centre of the whole region. From economical standpoint Dubrovnik is mainly funded by tourism and accompanying services while other production industry found no foothold in Dubrovnik nor the region. The most famous attraction of Dubrovnik is the centre, the ancient walled City which is listed on UNESCO World Heritage List. The walled part od Dubrovnik is referred to as "the City" or "the Old Town" and due to its stone white walls the City is nicknamed "the Pearl of the Adriatic"
Average yearly temperature for Dubrovnik is 17°C (63°F). Winters are mild with average temperature of 10°C (50°F) while summers are long and dry with plenty of sunshine and an average temperature of 26°C (79°F). Thus Dubrovnik in summer is all about beach holidays, leisure, and touristy adventures and sightseeing. 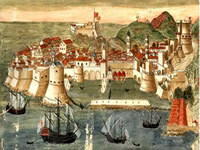 The beginnings of Dubrovnik fall in the relatively distant past and like many Mediterranean cities are veiled in legend. Among several legends about its origin, historically the most credible is the one linking the foundation of the new city with the destruction and fall of the Roman city of Epidaurum (at the site of present day Cavtat) in the 7th century.